How to maintain concrete mixer? The maintenance of concrete mixer is very important for concrete mixer owner, because it is directly relevant to the service life and efficiency of a concrete mixer. We will give some advice on maintenance of concrete mixer. 1. Lubricate the bearing parts regularly according to its service condition. Adopt calcium soap grease to lubricate it. Adopt engine oil to lubricate reducer. 2. Check the sealing of concrete mixer regularly. Inspect the quality of sealer in time when leakage is found. 3. Examine securing device frequently. Tighten up it the moment it becomes less crowded. 4. Inspect the control system constantly to guarantee its good contact and dry it frequently. 5. After long life-time service, blades and drum may be worn out. Check and adjust clearance between blades and drum. 6. Never put your hands or other clubs into the drum to avoid danger. 7. Don’t turn on/off concrete mixer constantly when using it. The interval time must above 5 seconds. 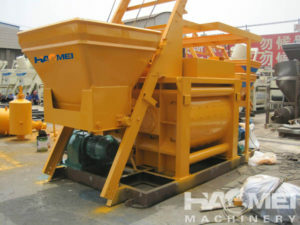 RE: How to maintain concrete mixer?